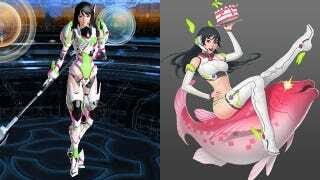 Phantasy Star Online 2's Character Creator Brings Sci-Fi Anime Characters to Life! Like most MMOs, Phantasy Star Online 2 comes with a robust character creator. And with its sci-fi setting, it's perfect for making all sorts of futuristic characters. I, for one, made Kotaku's very own anthropomorphic avatar, Kotaku-tan, as my character. Of course, I am not the only one to re-create a character. Japanese players have made characters from across many different sci-fi anime and games. Check out the gallery above to see their work. Phantasy Star Online 2 was released on July 4, 2012, on the PC in Japan and will be released outside of Japan early next year. The Japanese version is free to play and can be set up following our guide here. If you would rather just mess around with the character creator, it can be downloaded here (via 4Gamer). Kotaku-tan image courtesy of Meat Bun, creator and merchant of fine gaming shirts.